In the last few years, most borewells in our apartment in east Bengaluru, off Outer Ring Road, went dry with the depletion of groundwater levels. 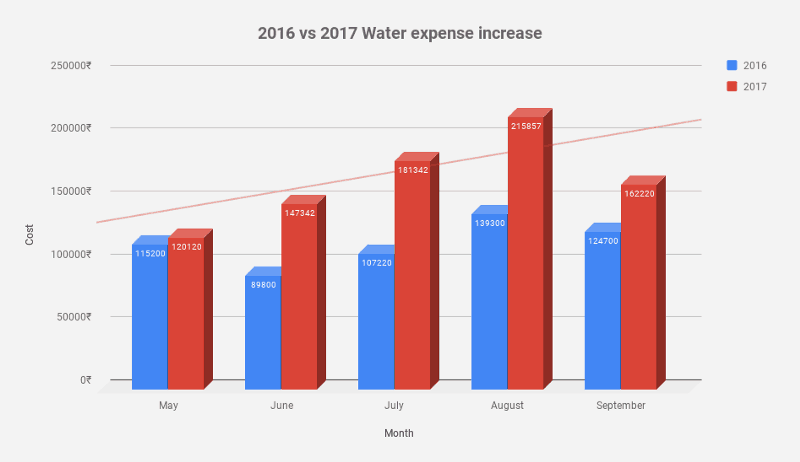 Our water expenses skyrocketed and we had to regularly keep increasing maintenance charges to cover the cost. 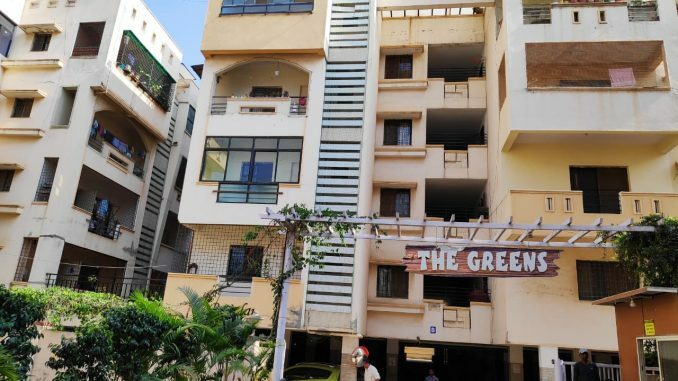 We are a mid-range 10-year-old apartment community with 171 flats spread across four blocks, having a swimming pool, a small clubhouse and a gym. Early last year, we implemented three measures to reduce water use. The outcome was that our water use and costs reduced by 52 percent in a year! Most apartments don’t come with water flow meters for individual flats; so was the case with our apartment. But, we figured the only way to hold people accountable was by installing meters for each flat. Install individual water flow meters for every inlet to a flat. 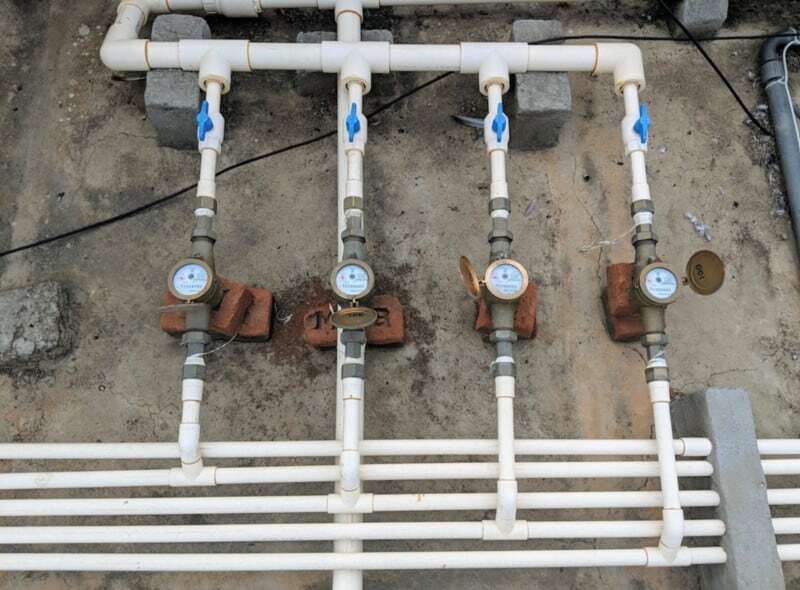 Connect all three inlets to a single point on the terrace, and install a single water flow meter there. The first option needed less work, but getting meter readings from inside the ducts every month was practically impossible. Over time, the labour involved in meter readings would offset the savings as well. Even the cost of maintaining remotely-readable smart water flow meters would not be manageable over time. So we narrowed down on the second option which required extensive plumbing work. STP water reuse was another major item on our agenda to reduce water wastage. We already had a well-functioning Sewage Treatment Plant (STP), managed by a dependable service provider. The challenge was to use treated water from the STP in flush tanks, without compromising on health and comfort. 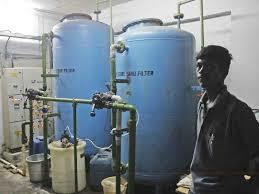 The treated water had to have parameters within the limits prescribed by authorities, without bad odour or colour. Connecting treated water to flush tanks was also a lot of work. But we decided not to install water flow meters to measure consumption of treated water by individual flats, to save on the cost of material and labour. This was a well-thought-out decision since treated water would be in excess of our requirement. To route treated water, we first installed two large tanks over an apartment block that was close to the STP. These tanks would supply water to smaller tanks installed on other apartment blocks; the smaller tanks in turn would be connected to the flush tanks in individual flats. 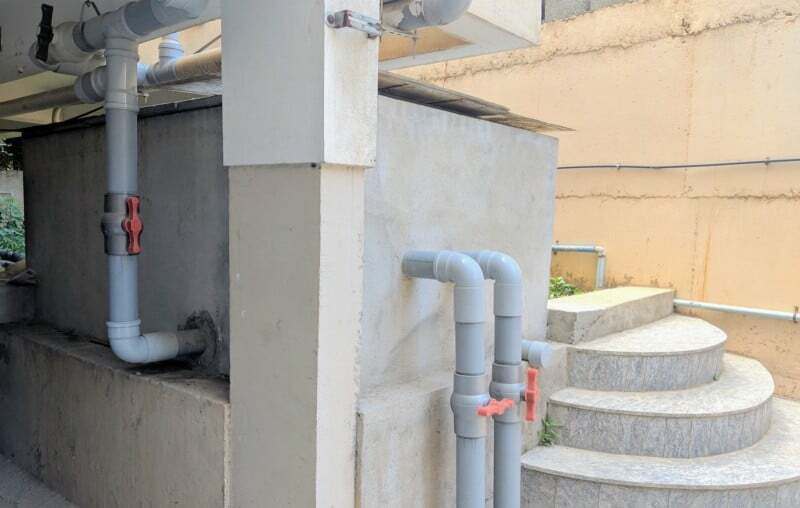 The work was done after identifying safe points on the terrace with the help of civil engineers, to ensure that the water tanks would not pose any danger to the buildings. From the STP, treated water gets pumped to the larger tanks, which then feeds the smaller tanks by gravity. Float and ball valves are installed in the lower tanks to automatically cut off excess supply and prevent overflow. The smaller tank then supplies water to all flush tanks and the garden. Bengaluru receives a lot of rain even during the summer. We were sure of saving water if we used rainwater to recharge our sumps and borewells. We connected all our open terraces (which we clean every fortnight) to two separate filters. We then connected the filtered water to our underground sumps and borewell recharge points. This saves us from buying water on many occasions even when the rains were for short durations, like less than an hour. The entire project was done in-house without involving contractors, and using only high quality products. The overall cost of works is described here. Did it work? How much did we save? Our water consumption and expenses went down drastically. It was surprising to see average savings of 52 percent in a year. 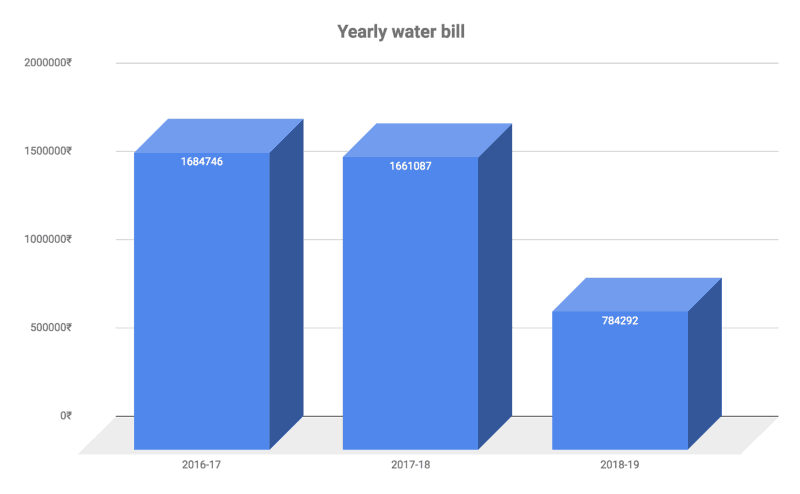 In 2016–17 and 2017–18, we had no water metering, enough rainwater collection or STP water reuse. After implementing these measures, in 2018-19, our water costs came down to Rs 7.8 lakhs, from over Rs 16 lakhs in previous years. Since the flow meter is used for water billing, individual flats that save water are highly benefited. Since water billing is separated from maintenance charges now, we have reduced maintenance charges by 25 paise per sq ft of apartment, per month. 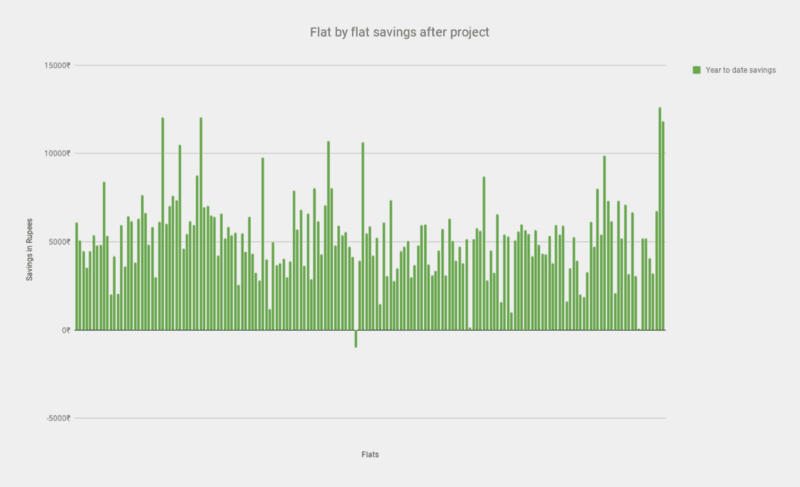 The overall savings of individual flats is shown in the chart below. In the five months after project completion, between April and August, each apartment saved Rs 5213 on average. In comparison, to implement the project, each flat had invested Rs 30,343. This means we can expect to break even within just 30 months! Amal Padmanabhan is a software engineer and resident of Whitefield. 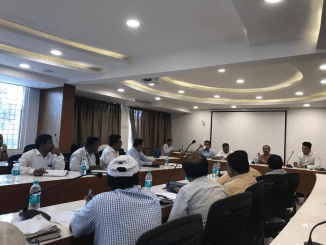 Recent BWSSB regulation requiring even existing apartments in core sewered areas of Bengaluru to compulsorily install STPs reeks of impracticality and an unfair targeting of apartment dwellers. A JP Nagar apartment complex celebrates a whole week of festivities, with fancy dress to music to painting contests. Excellent work and great planning & execution. All natural resources must be wisely used. It is social responsibility. One of IISc professor has such great ideas as well. Many apartments have RO plant for all water use. RO plant rejects 50% water. Authorities should not allow such RO. It should be for drinking only. I have 1 more technique for water metering system. I am ready to help you. Good initiatives and post implementation tracking of benefits is also important. Good article about water saving , really each apparent in Bangalore check possible ways to save water otherwise Bangalore will India’s capetown for water crisis soon. Very Good. Sometimes problem faced is that all residents do not agree on initial investments.